Butter is probably the most well known of the dairy products and it makes the most stringent demands on any material used for its packaging. Dairy products require high grease resistance, wet strength and purity and also some barrier to ultra violet light. 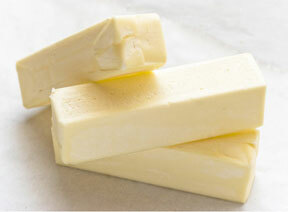 Pure / Genuine Vegetable Parchment (PVP) has been used for bulk and retail butter packaging for over 100 years. PVP is equally suitable for cheeses and dried milk packaging. Margarine has properties similar to those of butter and therefore PVP is ideally suitable for its packaging. What is Pure / Genuine Vegetable Parchment? Simply put, a normal paper machine intermeshes tiny fibres of cellulose together in the wet state. This is pressed and dried, and gets compacted into the form of paper as we know it. When seen under a microscope, the mesh of fibres is clearly seen, with individual fibres exhibiting their familiar long, tubular, well-defined shape. These fibres lie loosely interspersed and intertwined, with spaces in between them. These spaces readily allow water, oils and gasses to pass through the paper. The tighter the fibres are packed together, the more impenetrable the paper becomes. In the manufacture of Pure / Genuine Vegetable Parchment, the unique parchmentising process partially dissolves or melts down (under controlled conditions) the cellulose fibres, so that the microscopic fibrous structure actually disappears and gives place to a rather gelatinous mass. While in this state, the semi-liquid mass is squeezed under high pressure, again under controlled conditions. The spaces between fibres thus get "filled" with its own "juices". Later the dissolving action is completely arrested and the squeezed mass is re-solidified. This leads to a paper where the "normal" mesh of fibres has been replaced by a hard, dense, impenetrable sheet. 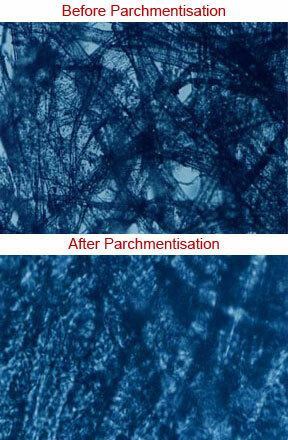 Due to the harsh actions on the cellulose structure and its chemical make-up during parchmentisation, the paper achieves the unique combination of properties of high strength when wet (wet strength), greaseproofness, resistance to penetration by water (although it is not water-proof), low air permeability and high chemical purity. It is, therefore, very suitable for wrapping fatty foods (such as butter), and it is used mainly for this purpose.